If you're looking for a great (and cheap!) hotel in Key West, CheapTickets is the best place to find them. We offer deals on the best 391 hotels throughout Key West. No matter what you're looking for, we have options for you. Grab great rates on the 70 affordable 3-star hotels that are easy on the wallet without sacrificing comfort. Looking for more luxury? Try one of the 25, 4-star hotel accommodations in Key West. No matter your budget needs, we've pulled out all the stops to make sure you have plenty of vacation options. Maybe you prefer to search for your hotel deals based on what each hotel offers? For example, let's say you just want to find a hotel or resort that has a pool to cool off in after a long day exploring Key West. Scroll down to choose from the 75 hotels in Key West that has a pool for guests. Or search for deals on Key West hotels offering free wifi or breakfast, non-smoking rooms, and more! CheapTickets is here to be your personal travel agent for your next trip to Key West. Get booking today! What hotels in Key West offer free wifi access? Are there deals on Key West hotels offering free breakfast? Yes! The only thing better than finding a great deal on a cheap hotel in Key West is finding one that offers free breakfast. Grab some eggs, a waffle, or some healthy oatmeal before a day full of exploring Key West and all that it has to offer. Below are just some of the many hotels that offer free breakfast in Key West. The Gardens Hotel is a 4.00 star rated hotel property in Key West that offers free breakfast. Ocean Key Resort - A Noble House Resort is a 4.00 star rated hotel property in Key West that offers free breakfast. Heron House - Adult Only is a 3.50 star rated hotel property in Key West that offers free breakfast. La Concha Hotel & Spa is a 4.00 star rated hotel property in Key West that offers free breakfast. What about deals on pet-friendly hotels in Key West? Key West is a great place to get outside and explore with your pets in tow so don't leave your furry friends behind. Below you'll find great deals on hotels in Key West that allow pets. Don't forget to bring plenty of treats! 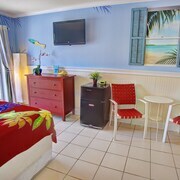 Key West Bayside Inn & Suites is a popular, pet-friendly, 2.00 star hotel in Key West. 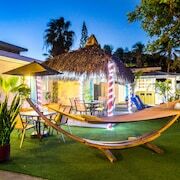 The Southernmost Inn-Adults Only is a popular, pet-friendly, 2.50 star hotel in Key West. 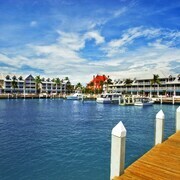 Coconut Mallory Resort And Marina By Kees Vacations is a popular, pet-friendly, 3.00 star hotel in Key West. Fairfield Inn and Suites by Marriott Key West is a popular, pet-friendly, 3.00 star hotel in Key West. Any good rates on Key West hotels with restaurants? Absolutely. Don't want to deal with planning our all your meals on your trip to Key West? We don't blame you. Keep the hangry away by staying in one of the 23 hotels that have restaurants. With a room at one of these spots, all it takes to get a good meal is hopping in the elevator. Check out some of the most popular hotels in Key West that have restaurants below. Book Eden HouseEden House is a 3.50 star hotel and has one or more restaurant options. 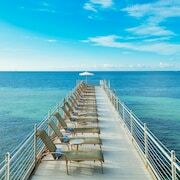 Book Key West Marriott Beachside HotelKey West Marriott Beachside Hotel is a 3.50 star hotel and has one or more restaurant options. Book Courtyard by Marriott Key West WaterfrontCourtyard by Marriott Key West Waterfront is a 3.00 star hotel and has one or more restaurant options. 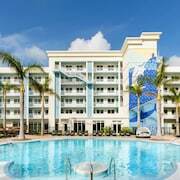 Book The Marker Waterfront Resort Key WestThe Marker Waterfront Resort Key West is a 4.00 star hotel and has one or more restaurant options. What are the cheapest hotels in Key West with pools? What's better after a long day exploring Key West then a relaxing dip in a pool? Finding the Key West hotel you need for a bargain! Cool off and unwind at one of our 75 Key West hotels with a pool. Browse some of the top deals on these hotels and resorts with pools in Key West below, but be warned: You may not want to check out! Paradise Inn Key West-Adults Only has a pool and a 3.50 star rating. 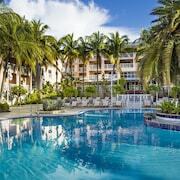 DoubleTree Resort by Hilton Grand Key - Key West has a pool and a 3.50 star rating. Silver Palms Inn has a pool and a 3.50 star rating. 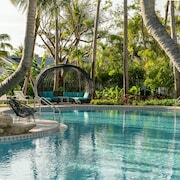 Albury Court Hotel - Key West has a pool and a 3.00 star rating. What hotels in Key West offer parking for guests? Once you've made your way to Key West, the last thing you want to deal with is finding parking close to your hotel. Avoid the hassle of parking around the block and carrying your luggage all the way to the lobby by booking one of our hotels with parking. Check out deals on some of the 79 hotels in Key West that offer parking for guests. Santa Maria Suites This hotel has a 4.00-star rating. Sheraton Suites Key West This hotel has a 3.50-star rating. Sunrise Suites Resort This hotel has a 3.00-star rating. Hyatt Centric Key West Resort and Spa This hotel has a 4.00-star rating. Do Key West hotels offer 24-hour concierge services? When you're on vacation, things don't always go according to plan. Travel with peace of mind when you book one of our 64 hotels in Key West with 24-hour concierge service. That way you know help is always phone call or elevator ride away. Try Almond Tree Inn. It's a 3.50 star rated hotel in Key West that offers concierge services 24 hours a day. Try Ibis Bay Beach Resort. It's a 2.50 star rated hotel in Key West that offers concierge services 24 hours a day. Try The Marker Waterfront Resort Key West. It's a 4.00 star rated hotel in Key West that offers concierge services 24 hours a day. Try Courtyard by Marriott Key West Waterfront. It's a 3.00 star rated hotel in Key West that offers concierge services 24 hours a day. What about low rates on non-smoking hotels in Key West? 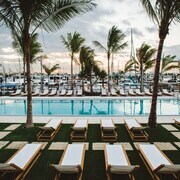 The Saint Hotel Key West- Autograph Collection This hotel has a 3.50-star rating. Silver Palms Inn This hotel has a 3.50-star rating. Banana Bay Resort and Marina This hotel has a 2.50-star rating. Albury Court Hotel - Key West This hotel has a 3.00-star rating. What are the cheapest Key West 3-star hotel deals? Our 3-star hotels bring you quality accommodations at a lower price point for the perfect, budget-friendly vacation in Key West. With 70 3-star hotels throughout Key West to choose from, you still have options. Browse our selection below. Sheraton Suites Key West. This casual resort is located three miles from the museums and boisterous streets of Old Town, and provides easy access to water sports at the popular Smathers Beach. Heron House - Adult Only. Heron House is surrounded by the 187 historic buildings of old Key West, and a 10-minute walk from the Ernest Hemingway Home and Museum and the waterfront at Mallory Square. There, guests can enjoy the nightly Sunset Celebration, attended by food vendors, musicians, and street performers. DoubleTree Resort by Hilton Grand Key - Key West. Located on the quieter side of Key West, this tropical-style resort offers complimentary shuttle service to the beach, 1 mile away, as well as to Duval Street, and golf course. Hilton Garden Inn Key West-The Keys Collection. This Key West historical district hotel is 2 blocks from Southernmost Point. Ernest Hemingway Home and Museum, and Key West Lighthouse and Keeper's Quarters Museum are both a half-mile away. What are the best deals on 4-Star Hotels in Key West? Key West is full of hotels and it can be hard to narrow down where you really want to stay. Luckily, we've done that hard work for you be narrowing you from 391 hotels throughout Key West, to the 25 4-star hotels in Key West. Our 4-star hotels in Key West are exactly what you need for your next family trip, romantic weekend, or solo getaway. Check out our most popular deals below. Southernmost Beach Resort: This Key West historical district hotel is 2 blocks from Southernmost Point. Ernest Hemingway Home and Museum, and Key West Lighthouse and Keeper's Quarters Museum are both a half-mile away. Casa Marina- A Waldorf Astoria Resort: Looking out over the Straits of Florida towards Cuba, this upscale resort places guests a 3-minute drive from downtown Key West. The Ernest Hemingway Home & Museum and Key West Lighthouse are both a 20-minute walk away. Those who want to explore the island by pedal power can rent a bicycle on site. 24 North Hotel Key West: Situated in Key West, this hotel is within 3 mi (5 km) of Key West Golf Club, Key West Art and Historical Society, and Smathers Beach. Fort East Martello Museum and Gallery and Robbie's are also within 3 mi (5 km). Parrot Key Hotel & Resort: Situated on the waterfront, this romantic resort is within 3 mi (5 km) of Smathers Beach, Ernest Hemingway Home and Museum, and Audubon House and Tropical Gardens. Mallory Square and Key West Art and Historical Society are also within 3 mi (5 km). What are the best activities to do in Key West? Key West Aquarium: Starting at just $16 per person. Shipwreck Treasure Museum: Starting at just $17 per person. Key West Conch Tour Train: Starting at just $32 per person. Historic Key West Old Town Trolley Hop-On Hop-Off Tour: Starting at just $39 per person. What are the most popular attractions in Key West? People travel to Key West from all around to witness the incredible sights and attractions. With 5 sights to see during your stay, you're sure to have a busy trip in Key West. Below, we've listed some of our favorites. Great location. Walking distance to everything . Beautiful grounds. Good Location. Clean but a bit old. Pricey for overall condition and services. Very nice property. Quiet and rooms were spacious and clean. The gardens were lovely. Only complaint was the only restaurant bar on the property was quite expensive. It's 2 miles from downtown and there is a shuttle that makes runs into Duvall Street a couple of times a day, but if you want to stay later than 4:30P you'll have to take a cab, Lyft or Uber.